"Just wait till last year." Last year was better, and the year before better still; ad infinitum, and perhaps even ad-nauseum. With each passing year, the salt out on Mr. Bonneville's flats diminishes in area and thickness, and the day must come when it will have disappeared forever. When that happens, a whole cult within the subculture of hotrodding will be ruined-it'll be just like a bunch of Druids without a Stonehenge, or lemmings without a sea. On the other hand, commercial interests will cackle merrily and rub their greedy little hands with glee, because tons of salt and minerals will be there for the grabbing. Between' the hot rodders, who simply want a place where they can go full-tilt in their incredible creations, and the commercial interests, who simply want another million or so lovely, green dollars to grace their corporate coffers, stands Mr. Everyman. Mr. E. probably isn't at all sure what he wants, but it doesn't take much imagination to figure what he is going to get: a great Freshwater Lake, without enough salt left in it to season an egg. Not a bad deal, actually, if the water left by the mineral barons is to be truly fresh and pure. Unfortunately, it's overwhelmingly likely that in the process of separating the salt from the water, industry will manage to pollute the pond. Their record in that regard hasn't been too good. On the. other hand, the 'Great 'Salt Lake is already a place where no fish will swim and no bird will fly, so this probably doesn't matter. It can be argued that the area has a certain barren and forbidding majesty, and that it deserves' to be preserved in its natural state fully as much as the California giant redwoods. The obvious answer is that if the redwoods had the dollar value of all that salt, we'd today be looking in awe at a collection of the world's largest stumps. Into this vast wilderness in Utah each summer comes a group of California migrants known collectively as the Southern California Timing Association or, in brief, the "SCTA". And with them are towed a wild conglomeration of high-speed automobiles called "hot rods". But watch it; these aren't just any 01' hot rods. Whatever image "hot rod" conjures up in your mind will probably be wrong. No Kalifornia Kustom Kars here. Lots of very uncustomized Ford roadsters and coupes, and sneaky Raymond Loewy Studebakers and .even old aircraft fuel pods with wheels sticking out, like insects. At the top of the heap are the sometimes beautiful, sometimes grotesque streamliners, which will soon enough have no place at all to run. They need a lot of room to reach their over 300-mph top speeds and the salt flats are their traditional habitat. For pure fun, there's nothing in the world that can match it for a certified, brass-bound exercise in futility. For example and to with the old Ford model-A roadster trying to go very, very fast. By "very, very fast" we mean much over 200 mph. These things will do the 200, but it's doubtful that they'll get much faster. Regulations require that they retain their stock bodies, with just the fenders removed, and not all the power in the world is going to make them go substantially more quickly. The in-group calls them "high boys" and put:; in big supercharged modern V -8 engines consuming the Devil's own dram for fuel. At this point in their development, available thrust from the tire contact patches is in excess of aerodynamic drag, and at ,full tilt they are simply banging their squarerigged bodies against a solid lump of air. Salt flies, deep ruts are cut in the course, and the howl of their exhaust shakes boulders from the distant mountains. Sometimes, often, in fact, the churning tires crawl around and a car will spin while butting its head against the 200-mph barrier and everyone thinks it a pretty good joke on the driver if he's able to walk away from the experience. timing-traps, Gang Busters. You can hear them coming and going, but all you see is a speed-blurred beastie that goes zap! and is no more. Perhaps the most impressive sight is down at the end of the course, where the streamliners are slowing, with their brake:..chutes deployed. The engines have been cut, and they come whistling past, still going about 200 mph, with only the wind noise and the creaking of the panels to te~l you they're not some unworldly apparition going nowhere in a fearsome hurry. There are other things, equally incredible. A stock-bodied Ford Thunderbird driven to Bonneville runs 200 mph and is driven home. 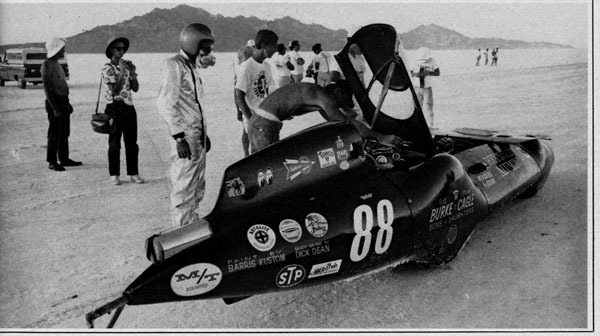 Bert Monroe, a New Zealander only slightly younger than the salt flats themselves, wiggles into the shell of his streamlined motorcycle and runs 180 mph. Bert's bike is, believe it or not, a 1920 Indian, for which he's made all kinds of special bits (including overhead-valve cylinder heads) in his backyard workshop. He hand-forged the connecting-rods from pieces 'of an old Ford axle. Monroe makes the trip up from Kiwi Land every year and hopes to get past the 200 mph mark before he, or the motorcycle (take your pick) falls apart. 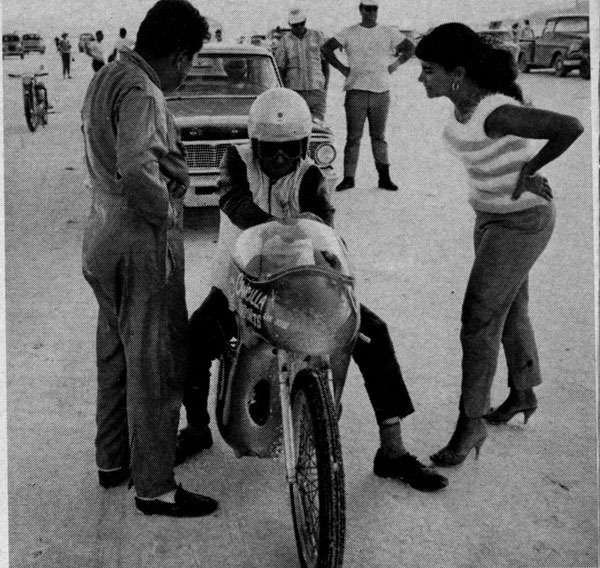 And then there's the not-inconsiderable social scene at Bonneville. 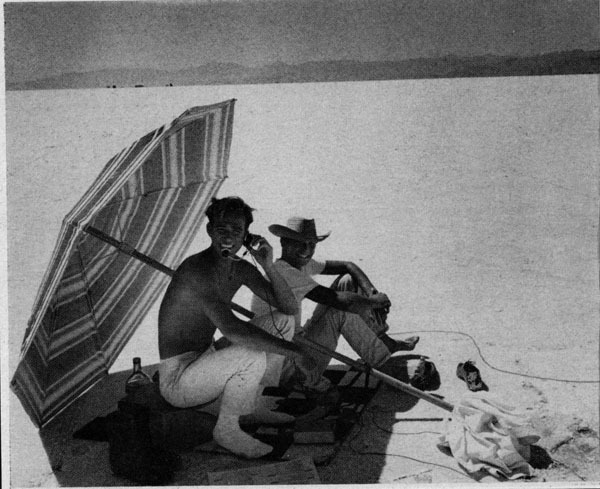 Everyone stays in the little town of Wendover, located (stranded, the cynics say) at the edge of the salt flats. Ah, the pleasures and fleshpots of city life. Don't miss the "State Line." It's a combination bus stop/restaurant! cabaret! casino right at the edge of town, just over the Nevada border. All the. things you can't do in Utah without risking arrest are provided at the State Line. Well, maybe not all, but slot-machines and booze and blackjack tables and what passes 'for racy entertainment out there in the hinterlands. While' you're up there at the State Line, you might take a look at the local version of the Colossus of Rhodes. Wendover Will, they calls it. Tons of structural steel and neon tubes, with a motordriven arm directing the weary traveler to the oasis below. 01' Will is magnificently awful, and, many's the lurid plan laid this year' to' do him in. This neon horror may be all right for the itinerant, but after the third or fourth day of looking at it, something is likely to snap. We heard whispered plans of sneaking up in the dead of night (distinguished from the dead of noon at Wendover only because even the sun has left town) with a cuttin' torch. Other schemes leaned less toward simple destruction, and more toward humbling adornment. One group was going to add a strategically-positioned appendage that would have made 01' Will the talk of Utah. Unfortunately, the salt dried enough for racing before the plan could come to fruition. Apart from the State Line there isn't much to do. Watching the trains pass through town to the railroad station won't take much slack out of your schedule: there are only two a day. Back in the days before shoes became so all- fired popular you could always walk over to the old, leaky water tower and wiggle your toes in the'mud, but toe-wiggling has about gone out of style. There is, as the Bonneville regulars will know, real adventure in eating at Wendover. Providence should have made the flats not potash, but bicarbonate of soda. Remember that this is the home of the. pan-fried prime:"'rib steak, where pomme frit is more like pomme fright. That famous gourmet,H. N. Manney the Thrid, would go into shock at the culinary atrocities committed here as a. matter of custom. It is, in every way, food that will "stick to your ribs." You couldn't get it off with a chisel. Maybe that's why Bonneville drivers go so fast and try so hard: anything that would stir one's system into activity must seem infinitely desirable. .
self. In the water and surrounding flats are billions of tons of minerals just asking to be taken. You may have heard that the extraction of magnesium from sea water is now a going commercial business. 'In this connection, it's interesting to note that while sea water is 3.5 per cent salt, the salt, content of Bonneyille brine is nearly 25 per cent. Think of it: a quart of salt in every liquid gallon, and that salt contains not only magnesium, but also valuable potassium and calcium chlorides. If Utah has its way, this will be gone. The salt, Wendover, the (belch!) food, the fast cars and dyspeptic men-everything. Mineral interests will 'get the salt and that will account for everything but Wendover. That little detail will be managed by a superhighway even now in the advanced-planning stage. Soon man will make the trip across from Salt Lake City so fast he won't be ready to water his mule when he reaches Wendover, and on that day, it'll be all over. Gone forever, with only a vast, brackish sink and tumbled, sun-bleached buildings huddled against the hills to make tomorrow wonder what it was, and why men had ever settled in such a spot.